This article is a guest blog contributed by Helen Borich, member of the editorial staff at MyHub Intranet Solutions. If you’re one of those people whose first thoughts on reading this title are, ‘What’s all the fuss about? My team are a happy enough bunch. I haven’t got time for employee engagement’, then this article is essential reading! You see, far from being just a fad or another trendy initiative, employee engagement should be a priority for every business. Get it right and you could be saving your company valuable pounds as well as increasing productivity. In this article we put forward five reasons why employee engagement makes good business sense. And once we’ve convinced you of the benefits, we’ll present three quick wins to help you get started. First though let’s be clear about what employee engagement is. At its heart employee engagement is about getting the best out of your staff members. And it involves having the right values, conditions and tools in place to do just that. It’s easy to spot a workplace with high levels of engaged employees – they’re the ones with motivated, committed and enthusiastic team members who feel valued and appreciated by their managers and the organisation as a whole. What’s more, research consistently tells us that businesses with engaged employees tend to have lower levels of staff turnover and sickness absence than their less engaged counterparts. They also have fewer workplace conflicts, grievances and performance management issues. And that in essence is why employee engagement is well worth the investment for every company. Let’s dig a little deeper though and present some hard facts and figures as to how exactly it can make a difference to your business. A happy and engaged employee is a more productive one and there’s plenty of evidence out there to confirm this. Research from the likes of Gallup suggests that companies with engaged employees have 21 per cent high productivity than their unengaged counterparts. And research carried out by Marks and Spencer discovered that over a four-year period those stores with improving levels of employee engagement, on average, delivered £62 million in more sales every year than stores with declining engagement levels. And so, there’s no doubt about it, high levels of employee engagement are a firm feature of successful and top performing companies. Companies with engaged employees also tend to be more profitable. In fact, companies with high rates of employee engagement reported 22 percent higher profitability than those businesses with low engagement rates. And perhaps more tellingly, companies are losing 20 to 25 per cent of their revenue each year due to disengaged employees. You see, just as engaged employees have a positive effect on team morale, camaraderie and the individual’s ability to perform work tasks well, so it follows that disengaged employees have a negative effect and can drag down the performance and morale of the whole office. Staff members that are happy and enthused at work generally take fewer days off sick. After all, there’s no need for a duvet day if you’re feeling positive and energised about your work. Businesses with engaged workers typically experience 37 per cent less absenteeism. And according to the CBI engaged employees take an average of 2.69 days sick a year, whereas the disengaged take 6.19. And so not only are your engaged employees less likely to be sick, they are also less likely to be absent from work. It’s no secret that engaged workplaces find it easier to attract and retain the best talent in the marketplace. It’s not rocket science, is it? Successful companies breed success and make themselves stand out in the ranks of employers. A key aspect to this is having a creative, vibrant workforce that is valued and appreciated by managers and executives alike. And that’s exactly what’s on offer with employee engagement. Engaged employees go the extra mile. And engaged workplaces tend to be innovative and more responsive to changes and challenges. Data from Gallup has indicated that higher levels of engagement in companies were strongly related to higher levels of innovation with engaged employees reporting that their job brings out their most creative ideas. 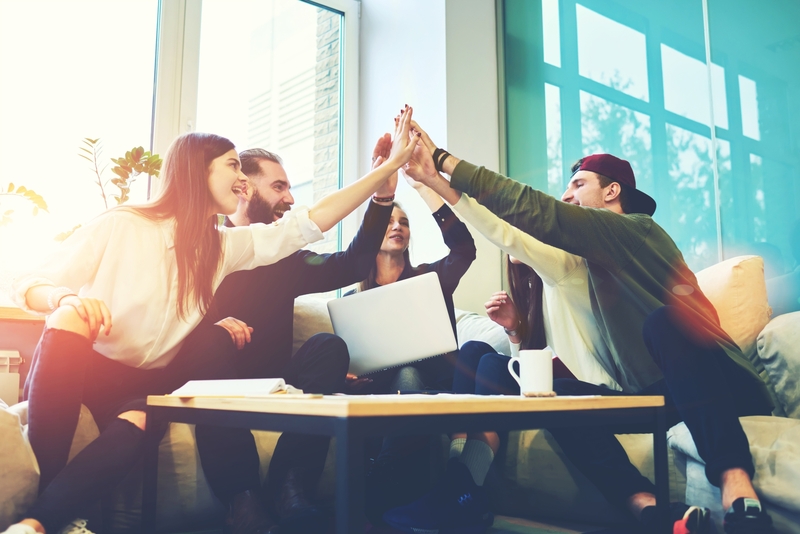 And so, in today’s highly competitive marketplace where it can be difficult for a business to differentiate itself from the competition, the innovation fostered by employee engagement could well give your company the edge over its competitors. So, now that we’ve made the case that employee engagement is an issue that you can no longer afford to ignore, how can you get started on the road to improving employee engagement in your business? Well, the most important thing to note here is that employee engagement is a journey and not a destination – it will be an ongoing process requiring a continuous level of organisational commitment. However, there are three quick wins that you can introduce now to help kick-start the process. Developing genuine, two-way conversations with staff members is an essential starting point for employee engagement. So make sure that you have robust horizontal and vertical lines of communication across your business. It could be in the form of team briefings, executive roadshows or staff conferences. And why not consider taking advantage of the opportunities offered by technology in the shape of an office intranet, company blog, podcasts or videos. Finding ways to actively listen to and engage with employees and feeding back on the organisational outcomes is critical to improving internal communications. Formally recognising and rewarding staff for a job well done is an easily implemented tool to increase employee motivation and engagement. Whether it’s a formal employee or team of the week programme, a write-up in the staff newsletter or a shared lunch for the team that’s just won an important tender, the main thing is the public recognition and appreciation that goes with it. Not only is it a clear demonstration of how much you value staff members, it will also serve to inspire other team members and spur them on to achieve the same. Without some sense of where you’re currently at, it’s hard to know where you need to go. Conducting an employee engagement survey is a good way to measure that all important baseline so that you can track progress. Google ‘employee engagement survey’ and you’ll find a whole raft of online resources such that a staff survey doesn’t have to cost the earth. Why not set up a cross-departmental staff team and charge them with developing a survey? The mere fact that you have taken this important step forward will have a positive impact on engagement rates. Employee engagement is not just a tick box exercise or another new initiative; it’s here to stay. And it’s here to stay because quite simply it makes good business sense. Employee engagement will increase your company’s productivity, profitability and competitiveness. And it could well set you apart from others in the marketplace. And so, try our quick wins and see for yourself what a difference it can make. Helen Borich is a member of the editorial staff of MyHub Intranet Solutions. MyHub is a cloud-based intranet software solution that provides businesses with a range of powerful business tools via their own secure customizable intranet site.